For the medieval confederation of Oghuz Turkic tribes in Western Asia, see Turkomania (disambiguation). Anthem: "Garaşsyz Bitarap Türkmenistanyň Döwlet Gimni"
Turkmenistan (/tɜːrkˈmɛnɪstæn/ ( listen) or /tɜːrkmɛnɪˈstɑːn/ ( listen); Turkmen: Türkmenistan, pronounced [tʏɾkmɛnɪˈθtɑn]), formerly known as Turkmenia, officially the Republic of Turkmenistan, is a country in Central Asia, bordered by Kazakhstan to the northwest, Uzbekistan to the north and east, Afghanistan to the southeast, Iran to the south and southwest, and the Caspian Sea to the west. 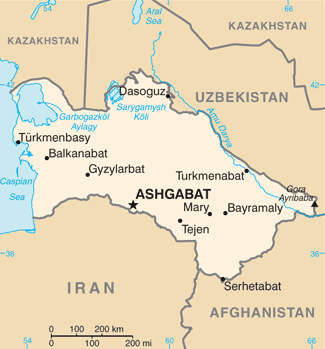 Ashgabat is the capital and largest city. The population of the country is 5.6 million, the lowest of the Central Asian republics and one of the most sparsely populated in Asia. Turkmenistan has been at the crossroads of civilizations for centuries. In medieval times, Merv was one of the great cities of the Islamic world and an important stop on the Silk Road, a caravan route used for trade with China until the mid-15th century. Annexed by the Russian Empire in 1881, Turkmenistan later figured prominently in the anti-Bolshevik movement in Central Asia. In 1925, Turkmenistan became a constituent republic of the Soviet Union, Turkmen Soviet Socialist Republic (Turkmen SSR); it became independent upon the dissolution of the Soviet Union in 1991. Turkmenistan possesses the world's sixth largest reserves of natural gas resources. Most of the country is covered by the Karakum (Black Sand) Desert. From 1993 to 2017, citizens received government-provided electricity, water and natural gas free of charge. The sovereign state of Turkmenistan was ruled by President for Life Saparmurat Niyazov (also known as Turkmenbashi) until his death in 2006. Gurbanguly Berdimuhamedow was elected president in 2007. According to Human Rights Watch, "Turkmenistan remains one of the world’s most repressive countries. The country is virtually closed to independent scrutiny, media and religious freedoms are subject to draconian restrictions, and human rights defenders and other activists face the constant threat of government reprisal." After suspending the death penalty, the use of capital punishment was formally abolished in the 2008 constitution. Muslim chroniclers like Ibn Kathir suggested that the etymology of Turkmenistan came from the words Türk and Iman (Arabic: إيمان‎, "faith, belief") in reference to a massive conversion to Islam of two hundred thousand households in the year 971. Historically inhabited by the Indo-Iranians, the written history of Turkmenistan begins with its annexation by the Achaemenid Empire of Ancient Iran. In the 8th century AD, Turkic-speaking Oghuz tribes moved from Mongolia into present-day Central Asia. Part of a powerful confederation of tribes, these Oghuz formed the ethnic basis of the modern Turkmen population. In the 10th century, the name "Turkmen" was first applied to Oghuz groups that accepted Islam and began to occupy present-day Turkmenistan. There they were under the dominion of the Seljuk Empire, which was composed of Oghuz groups living in present-day Iran and Turkmenistan. Turkmen soldiers in the service of the empire played an important role in the spreading of Turkic culture when they migrated westward into present-day Azerbaijan and eastern Turkey. In the 12th century, Turkmen and other tribes overthrew the Seljuk Empire. In the next century, the Mongols took over the more northern lands where the Turkmens had settled, scattering the Turkmens southward and contributing to the formation of new tribal groups. The sixteenth and eighteenth centuries saw a series of splits and confederations among the nomadic Turkmen tribes, who remained staunchly independent and inspired fear in their neighbors. By the 16th century, most of those tribes were under the nominal control of two sedentary Uzbek khanates, Khiva and Bukhoro. Turkmen soldiers were an important element of the Uzbek militaries of this period. In the 19th century, raids and rebellions by the Yomud Turkmen group resulted in that group's dispersal by the Uzbek rulers. According to Paul R. Spickard, "Prior to the Russian conquest, the Turkmen were known and feared for their involvement in the Central Asian slave trade." Russian forces began occupying Turkmen territory late in the 19th century. From their Caspian Sea base at Krasnovodsk (now Turkmenbashi), the Russians eventually overcame the Uzbek khanates. In 1881, the last significant resistance in Turkmen territory was crushed at the Battle of Geok Tepe, and shortly thereafter Turkmenistan was annexed, together with adjoining Uzbek territory, into the Russian Empire. In 1916 the Russian Empire's participation in World War I resonated in Turkmenistan, as an anticonscription revolt swept most of Russian Central Asia. Although the Russian Revolution of 1917 had little direct impact, in the 1920s Turkmen forces joined Kazakhs, Kyrgyz, and Uzbeks in the so-called Basmachi Rebellion against the rule of the newly formed Soviet Union. In 1924 the Turkmen Soviet Socialist Republic was formed from the tsarist province of Transcaspia. By the late 1930s, Soviet reorganization of agriculture had destroyed what remained of the nomadic lifestyle in Turkmenistan, and Moscow controlled political life. The Ashgabat earthquake of 1948 killed over 110,000 people, amounting to two-thirds of the city's population. During the next half-century, Turkmenistan played its designated economic role within the Soviet Union and remained outside the course of major world events. Even the major liberalization movement that shook Russia in the late 1980s had little impact. However, in 1990 the Supreme Soviet of Turkmenistan declared sovereignty as a nationalist response to perceived exploitation by Moscow. Although Turkmenistan was ill-prepared for independence and then-communist leader Saparmurat Niyazov preferred to preserve the Soviet Union, in October 1991 the fragmentation of that entity forced him to call a national referendum that approved independence. On 26 December 1991, the Soviet Union ceased to exist. Niyazov continued as Turkmenistan's chief of state, replacing communism with a unique brand of independent nationalism reinforced by a pervasive cult of personality. A 1994 referendum and legislation in 1999 abolished further requirements for the president to stand for re-election (although in 1992 he completely dominated the only presidential election in which he ran, as he was the only candidate and no one else was allowed to run for the office), making him effectively president for life. During his tenure, Niyazov conducted frequent purges of public officials and abolished organizations deemed threatening. Throughout the post-Soviet era, Turkmenistan has taken a neutral position on almost all international issues. Niyazov eschewed membership in regional organizations such as the Shanghai Cooperation Organisation, and in the late 1990s he maintained relations with the Taliban and its chief opponent in Afghanistan, the Northern Alliance. He offered limited support to the military campaign against the Taliban following the 11 September 2001 attacks. In 2002 an alleged assassination attempt against Niyazov led to a new wave of security restrictions, dismissals of government officials, and restrictions placed on the media. Niyazov accused exiled former foreign minister Boris Shikhmuradov of having planned the attack. Between 2002 and 2004, serious tension arose between Turkmenistan and Uzbekistan because of bilateral disputes and Niyazov's implication that Uzbekistan had a role in the 2002 assassination attempt. In 2004 a series of bilateral treaties restored friendly relations. In the parliamentary elections of December 2004 and January 2005, only Niyazov's party was represented, and no international monitors participated. In 2005 Niyazov exercised his dictatorial power by closing all hospitals outside Ashgabat and all rural libraries. The year 2006 saw intensification of the trends of arbitrary policy changes, shuffling of top officials, diminishing economic output outside the oil and gas sector, and isolation from regional and world organizations. China was among a very few nations to whom Turkmenistan made significant overtures. The sudden death of Niyazov at the end of 2006 left a complete vacuum of power, as his cult of personality, compared to the one of former president Kim Il-sung of North Korea, had precluded the naming of a successor. Deputy Prime Minister Gurbanguly Berdimuhamedow, who was named interim head of government, won the special presidential election held in early February 2007. He was re-elected in 2012 with 97% of the vote. After 69 years as part of the Soviet Union (including 67 years as a union republic), Turkmenistan declared its independence on 27 October 1991. President for Life Saparmurat Niyazov, a former bureaucrat of the Communist Party of the Soviet Union, ruled Turkmenistan from 1985, when he became head of the Communist Party of the Turkmen SSR, until his death in 2006. He retained absolute control over the country after the dissolution of the Soviet Union. On 28 December 1999, Niyazov was declared President for Life of Turkmenistan by the Mejlis (parliament), which itself had taken office a week earlier in elections that included only candidates hand-picked by President Niyazov. No opposition candidates were allowed. Since the December 2006 death of Niyazov, Turkmenistan's leadership has made tentative moves to open up the country. His successor, President Gurbanguly Berdimuhamedow, repealed some of Niyazov's most idiosyncratic policies, including banning opera and the circus for being "insufficiently Turkmen". In education, Berdimuhamedow's government increased basic education to ten years from nine years, and higher education was extended from four years to five. It also increased contacts with the West, which is eager for access to the country's natural gas riches. The politics of Turkmenistan take place in the framework of a presidential republic, with the President both head of state and head of government. Under Niyazov, Turkmenistan had a one-party system; however, in September 2008, the People's Council unanimously passed a resolution adopting a new Constitution. The latter resulted in the abolition of the Council and a significant increase in the size of Parliament in December 2008 and also permits the formation of multiple political parties. The former Communist Party, now known as the Democratic Party of Turkmenistan, is the dominant party. The second party, the Party of Industrialists and Entrepreneurs was established in August 2012. Political gatherings are illegal unless government sanctioned. In 2013 the first multi-party Parliamentary Elections were held in Turkmenistan. Turkmenistan was a one-party state from 1991 to 2012; however, the 2013 elections were widely seen as mere window dressing. In practice, all parties in parliament operate jointly under the direction of the DPT. There are no true opposition parties in the Turkmen parliament. Turkmenistan's declaration of "permanent neutrality" was formally recognized by the United Nations in 1995. Former President Saparmurat Niyazov stated that the neutrality would prevent Turkmenistan from participating in multi-national defense organizations, but allows military assistance. Its neutral foreign policy has an important place in the country's constitution. Turkmenistan has diplomatic relations with 132 countries. Turkmenistan has been widely criticised for human rights abuses and has imposed severe restrictions on foreign travel for its citizens. Discrimination against the country's ethnic minorities remains in practice. Universities have been encouraged to reject applicants with non-Turkmen surnames, especially ethnic Russians. It is forbidden to teach the customs and language of the Baloch, an ethnic minority. [citation needed] The same happens to Uzbeks, though the Uzbek language was formerly taught in some national schools. According to Reporters Without Borders's 2014 World Press Freedom Index, Turkmenistan had the 3rd worst press freedom conditions in the world (178/180 countries), just before North Korea and Eritrea. It is considered to be one of the "10 Most Censored Countries". Each broadcast under Niyazov began with a pledge that the broadcaster's tongue will shrivel if he slanders the country, flag, or president. Religious minorities are discriminated against for conscientious objection and practicing their religion by imprisonment, preventing foreign travel, confiscating copies of Christian literature or defamation. Many detainees who have been arrested for exercising their freedom of religion or belief, were tortured and subsequently sentenced to imprisonment, many of them without a court decision. Homosexual acts are illegal in Turkmenistan. Despite the launch of Turkmenistan's first communication satellite—TurkmenSat 1—in April 2015, the Turkmen government banned all satellite dishes in Turkmenistan the same month. The statement issued by the government indicated that all existing satellite dishes would have to be removed or destroyed—despite the communications receiving antennas having been legally installed since 1995—in an effort by the government to fully block access of the population to many "hundreds of independent international media outlets which are currently accessible in the country only through satellite dishes, including all leading international news channels in different languages. The main target of this campaign is Radio Azatlyk, the Turkmen-language service of Radio Free Europe/Radio Liberty. It is the only independent source of information about Turkmenistan and the world in the Turkmen language and is widely listened to in the country." Turkmenistan is divided into five provinces or welayatlar (singular welayat) and one capital city district. The provinces are subdivided into districts (etraplar, sing. etrap), which may be either counties or cities. 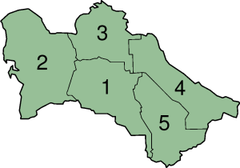 According to the Constitution of Turkmenistan (Article 16 in the 2008 Constitution, Article 47 in the 1992 Constitution), some cities may have the status of welaýat (province) or etrap (district). At 488,100 km2 (188,500 sq mi), Turkmenistan is the world's 52nd-largest country. It is slightly smaller than Spain and somewhat larger than the US state of California. It lies between latitudes 35° and 43° N, and longitudes 52° and 67° E. Over 80% of the country is covered by the Karakum Desert. The center of the country is dominated by the Turan Depression and the Karakum Desert. The Kopet Dag Range, along the southwestern border, reaches 2,912 metres (9,554 feet) at Kuh-e Rizeh (Mount Rizeh). The Great Balkhan Range in the west of the country (Balkan Province) and the Köýtendag Range on the southeastern border with Uzbekistan (Lebap Province) are the only other significant elevations. The Great Balkhan Range rises to 1,880 metres (6,170 ft) at Mount Arlan and the highest summit in Turkmenistan is Ayrybaba in the Kugitangtau Range – 3,137 metres (10,292 ft). The Kopet Dag mountain range forms most of the border between Turkmenistan and Iran. Rivers include the Amu Darya, the Murghab, and the Tejen. The Turkmen shore along the Caspian Sea is 1,748 kilometres (1,086 mi) long. The Caspian Sea is entirely landlocked, with no natural access to the ocean, although the Volga–Don Canal allows shipping access to and from the Black Sea. The country possesses the world's sixth largest reserves of natural gas and substantial oil resources. Saparmurat Hajji Mosque featured on the obsolete 10,000 manat banknote. President Niyazov spent much of the country's revenue on extensively renovating cities, Ashgabat in particular. Corruption watchdogs voiced particular concern over the management of Turkmenistan's currency reserves, most of which are held in off-budget funds such as the Foreign Exchange Reserve Fund in the Deutsche Bank in Frankfurt, according to a report released in April 2006 by London-based non-governmental organization Global Witness. According to the decree of the Peoples' Council of 14 August 2003, electricity, natural gas, water and salt will be subsidized for citizens up to 2030. Under current regulations, every citizen is entitled to 35 kilowatt hours of electricity and 50 cubic meters of natural gas each month. The state also provides 250 liters (66 gallons) of water per day. In addition car drivers were entitled to 120 litres of free petrol a month until 1 July 2014. Drivers of buses, lorries and tractors could get 200 litres of fuel and motorcyclists and scooter riders 40 litres free. On 5 September 2006, after Turkmenistan threatened to cut off supplies, Russia agreed to raise the price it pays for Turkmen natural gas from $65 to $100 per 1,000 cubic meters. Two-thirds of Turkmen gas goes through the Russian state-owned Gazprom. As of May 2011[update], the Galkynysh Gas Field has the second-largest volume of gas in the world, after the South Pars field in the Persian Gulf. Reserves at the Galkynysh Gas Field are estimated at around 21.2 trillion cubic metres. The Turkmenistan Natural Gas Company (Türkmengaz), under the auspices of the Ministry of Oil and Gas, controls gas extraction in the country. Gas production is the most dynamic and promising sector of the national economy. In 2010 Ashgabat started a policy of diversifying export routes for its raw materials. China is set to become the largest buyer of gas from Turkmenistan over the coming years as a pipeline linking the two countries, through Uzbekistan and Kazakhstan, reaches full capacity. In addition to supplying Russia, China and Iran, Ashgabat took concrete measures to accelerate progress in the construction of the Turkmenistan-Afghanistan-Pakistan and India pipeline (TAPI). Turkmenistan has previously estimated the cost of the project at $3.3 billion. On 21 May 2010, president Gurbanguly Berdimuhamedow unexpectedly signed a decree stating that companies from Turkmenistan will build an internal East-West gas pipeline allowing the transfer of gas from the biggest deposits in Turkmenistan (Dowlatabad and Yoloten) to the Caspian coast. The East-West pipeline is planned to be 773-kilometre (483-mile) long and have a carrying capacity of 30 bn m³ annually, at a cost of between one and one and a half billion US dollars. The Trans-Caspian pipeline (TCP) project, backed by the European Union, has so far remained on paper, partly due to disputes about the Caspian Sea's legal status and Turkmenistan's refusal to sign production-sharing agreements with foreign companies for major hydrocarbon deposits. The tourism industry has been growing rapidly in recent years, especially medical tourism. This is primarily due to the creation of the Avaza tourist zone on the Caspian Sea. Every traveler must obtain a visa before entering Turkmenistan. To obtain a tourist visa, citizens of most countries need visa support from a local travel agency. For tourists visiting Turkmenistan, there are organized tours with a visit to historical sites Daşoguz, Konye-Urgench, Nisa, Merv, Mary, beach tours to Avaza and medical tours and holidays in Mollakara, Yylly suw and Archman. Most of Turkmenistan's citizens are ethnic Turkmens with sizeable minorities of Uzbeks and Russians. Smaller minorities include Kazakhs, Tatars, Ukrainians, Kurds (native to Kopet Dagh mountains), Armenians, Azeris, Balochs and Pashtuns. The percentage of ethnic Russians in Turkmenistan dropped from 18.6% in 1939 to 9.5% in 1989. In 2012 it was confirmed that the population of Turkmenistan decreased due to some specific factors[which?] and is less than the previously estimated 5 million. Turkmen ( Turkic language / Oghuz language ) is the official language of Turkmenistan (per the 1992 Constitution), although Russian still is widely spoken in cities as a "language of inter-ethnic communication". Turkmen is spoken by 72% of the population, Russian 12%, Uzbek 9%, and other languages 7%. (Russian (349,000), Uzbek (317,000), Kazakh (88,000), Tatar (40,400), Ukrainian (37,118), Azerbaijani (33,000), Armenian (32,000), Northern Kurdish (20,000), Lezgian (10,400), Persian (8,000), Belarusian (5,290), Erzya (3,490), Korean (3,490), Bashkir (2,610), Karakalpak (2,540), Ossetic (1,890), Dargwa (1,600), Lak (1,590), Tajik (1,280), Georgian (1,050), Lithuanian (224), Tabasaran (180), Dungan). According to the CIA World Factbook, Muslims constitute 89% of the population while 9% of the population are followers of the Eastern Orthodox Church and the remaining 2% religion is reported as non-religious. However, according to a 2009 Pew Research Center report, 93.1% of Turkmenistan's population is Muslim. Former president Saparmurat Niyazov ordered that basic Islamic principles be taught in public schools. More religious institutions, including religious schools and mosques, have appeared, many with the support of Saudi Arabia, Kuwait, and Turkey. Religious classes are held in both schools and mosques, with instruction in Arabic language, the Qur'an and the hadith, and history of Islam. Most Christians in Turkmenistan belong to Eastern Orthodoxy (about 5% of the population). The Russian Orthodox Church is under the jurisdiction of the Russian Orthodox Archbishop in Tashkent, Uzbekistan. There are three Russian Orthodox Churches in Ashgabat, two in Turkmenabat, in Mary, Turkmenbashi, Balkanabat, Bayram-Ali and Dushauguze one each. The highest Russian Orthodox priest in Turkmenistan is based in Ashgabat. There is one Russian orthodox monastery, in Ashgabat. Turkmenistan has no Russian Orthodox seminary, however. There are also small communities of the following denominations: the Armenian Apostolic Church, the Roman Catholic Church, Pentecostal Christians, the Protestant Word of Life Church, the Greater Grace World Outreach Church, the New Apostolic Church, Jehovah's Witnesses, Jews, and several unaffiliated, nondenominational evangelical Christian groups. In addition, there are small communities of Baha'is, Baptists, Seventh-day Adventists, and Hare Krishnas. The history of Bahá'í Faith in Turkmenistan is as old as the religion itself, and Bahá'í communities still exist today. The first Bahá'í House of Worship was built in Ashgabat at the beginning of the twentieth century. It was seized by the Soviets in the 1920s and converted to an art gallery. It was heavily damaged in the earthquake of 1948 and later demolished. The site was converted to a public park. There are a number of newspapers and monthly magazines published in Turkmenistan. Turkmenistan currently broadcasts 7 national TV channels through satellite. They are Altyn asyr, Yashlyk, Miras, Turkmenistan (in 7 languages), Türkmen Owazy, Turkmen sporty and Ashgabat. There are no commercial or private TV stations. Articles published by the state-controlled newspapers are heavily censored and written to glorify the state and its leader. The task for modern Turkmen architecture is diverse application of modern aesthetics, the search for an architect's own artistic style and inclusion of the existing historico-cultural environment. Most buildings are faced with white marble. Major projects such as Turkmenistan Tower, Bagt köşgi, Alem Cultural and Entertainment Center have transformed the country's skyline and promotes its contemporary identity. Turkmenistan's cities of Turkmenbashi and Ashgabat both have scheduled commercial air service. The largest airport is Ashgabat Airport, with regular international flights. Additionally, scheduled international flights are available to Turkmenbashi. The principal government-managed airline of Turkmenistan is Turkmenistan Airlines. It is also the largest airline operating in Turkmenistan. Turkmenistan Airlines' passenger fleet is composed only of American Boeing aircraft. Air transport carries more than two thousand passengers daily in the country. International flights annually transport over half a million people into and out of Turkmenistan. Turkmenistan Airlines operates regular flights to Moscow, London, Frankfurt, Birmingham, Bangkok, Delhi, Abu Dhabi, Amritsar, Kiev, Lviv, Beijing, Istanbul, Minsk, Almaty, Tashkent and St. Petersburg. Since 1962, the Turkmenbashi International Seaport operates a ferry to the port of Baku, Azerbaijan. In recent years there has been increased tanker transport of oil. The port of Turkmenbashi, associated rail ferries to the ports of the Caspian Sea (Baku, Aktau). In 2011, it was announced that the port of Turkmenbashi will be completely renovated. The project involves the reconstruction of the terminal disassembly of old and construction of new berths. Rail is one of the main modes of transport in Turkmenistan. Trains have been used in the nation since 1876. Originally it was part of the Trans-Caspian railway, then the Central Asian Railway, after the collapse of the USSR, the railway network in Turkmenistan owned and operated by state-owned Türkmendemirýollary. The total length of railways is 3181 km. Passenger traffic railways of Turkmenistan is limited by national borders of the country, except in the areas along which the transit trains coming from Tajikistan to Uzbekistan and beyond. Locomotive fleet consists of a series of soviet-made locomotives 2TE10L, 2TE10U, 2M62U also have several locomotives made in China. Shunting locomotives include Soviet-made TEM2, TEM2U, CME3. Currently under construction railway Kazakhstan-Turkmenistan-Iran and Turkmenistan-Afghanistan-Tajikistan. ^ "Turkmenistan country profile, Political Rights and Civil Liberties". Freedom House. 10 January 2018. ^ Государственный комитет Туркменистана по статистике : Информация о Туркменистане : О Туркменистане Archived 7 January 2012 at the Wayback Machine : Туркменистан — одна из пяти стран Центральной Азии, вторая среди них по площади (491,21 тысяч км2), расположен в юго-западной части региона в зоне пустынь, севернее хребта Копетдаг Туркмено-Хорасанской горной системы, между Каспийским морем на западе и рекой Амударья на востоке. ^ Independence of Turkmenia Declared After a Referendum; New York Times – 28 October 1991. Retrieved on 16 November 2016. ^ a b "A New Customer for Turkmen Natural Gas". Retrieved 22 November 2017. ^ "Turkmen ruler ends free power, gas, water – World News". Hürriyet Daily News. ^ "World Report 2014: Turkmenistan". Hrw.org. 2 January 2014. Retrieved 28 January 2015. ^ "BBC News – Asia-Pacific – Turkmenistan suspends death penalty". news.bbc.co.uk. ^ a b c d e f g h i j k l m n o p q r s t u v w x y z aa ab ac ad ae af ag ah ai aj ak "Country Profile: Turkmenistan" (PDF). Library of Congress Federal Research Division. February 2007. Retrieved 25 November 2013. ^ Paul R. Spickard (2005). Race and Nation: Ethnic Systems in the Modern World. Routledge. p. 260. ISBN 978-0-415-95003-9. ^ Scott Cameron Levi (January 2002). The Indian Diaspora in Central Asia and Its Trade: 1550–1900. BRILL. p. 68. ISBN 978-90-04-12320-5. ^ "Comments for the significant earthquake". Significant Earthquake Database. National Geophysical Data Center. Retrieved 12 June 2015. ^ "Turkmenistan president wins election with 96.9% of vote". London: theguardian.com. 13 February 2012. Retrieved 25 November 2013. ^ Stronski, Paul (22 May 2017). "Независимому Туркменистану двадцать пять лет: цена авторитаризма". carnegie.ru (in Russian). Retrieved 23 May 2017. ^ "A/RES/50/80. Maintenance of international security". un.org. ^ "Diplomatic relations". Mfa.gov.tm. Archived from the original on 4 March 2016. Retrieved 14 February 2016. ^ "Russians 'flee' Turkmenistan". BBC News. 20 June 2003. Retrieved 25 November 2013. ^ "Turkmenistan: Russian Students Targeted". Institute for War and Peace Reporting. 21 February 2005. Retrieved 25 November 2013. ^ "Alternative report on the Human Rights situation in Turkmenistan for the Universal Periodic Review" (PDF) (Press release). FIDH. Retrieved 23 July 2010. ^ "Reporters Without Borders". rsf.org. Archived from the original on 14 February 2014. Retrieved 14 February 2016. ^ "10 Most Censored Countries". Cpj.org. Retrieved 30 January 2012. ^ a b "Turkmenistan: International Religious Freedom Report 2004". www.state.gov/. United States Department of State, Bureau of Democracy, Human Rights, and Labor. 21 May 2015. Retrieved 15 March 2016. ^ "Turkmenistan 2015/2016: Freedom of religion". www.amnesty.org. Retrieved 15 March 2016. ^ "One Year of Unjust Imprisonment in Turkmenistan". jw.org. ^ Service, Forum 18 News. "Forum 18: TURKMENISTAN: Torture and jail for one 4 year and 14 short-term prisoners of conscience – 21 May 2015". www.forum18.org. Retrieved 20 January 2017. ^ "LGBT relationships are illegal in 74 countries, research finds". The Independent. 17 May 2016. ^ Forrester, Chris (22 April 2015). "Satellite dishes banned in Turkmenistan". Advanced Television. Retrieved 23 April 2015. ^ "Mount Arlan". Peakbagger.com. 1 November 2004. Retrieved 30 January 2012. ^ "Turkmenistan leader wants to end free power, gas, and water". 6 July 2017. Retrieved 22 November 2017. ^ "Business | Russia reaches Turkmen gas deal". BBC News. 5 September 2006. Retrieved 3 May 2010. ^ Solovyov, Dmitry (25 May 2011). "Turkmen gas field to be world's second-largest". Reuters. ^ a b "Turkmenistan. Diversifying export routes". Europarussia.com. 3 February 2010. Retrieved 25 November 2013. ^ "China plays Pipelineistan'". Atimes.com. 24 December 2009. Retrieved 3 May 2010. ^ "Turkmenistan boosts gas export capacity with East-West link". Reuters. Reuters.com. 23 December 2015. ^ "Turkmenistan Oil and Gas". Turkmenistanoil.tripod.com. Retrieved 25 November 2013. ^ "Turkmenistan study". Countrystudies.us. Retrieved 25 November 2013. ^ "The ten largest cotton producing countries in 2009". Statista.com. Retrieved 25 November 2013. ^ "Turkmenistan to Privilege US Farm Machinery Manufacturers". The Gazette of Central Asia. Satrapia. 26 July 2012. Retrieved 4 August 2012. ^ "Las Vegas on the Caspian?". aljazeera.com. ^ "Ethnic composition of Turkmenistan in 2001" (37–38). Demoscope Weekly. 14 April 2001. Retrieved 25 November 2013. ^ "MAPPING THE GLOBAL MUSLIM POPULATION : A Report on the Size and Distribution of the World's Muslim Population" (PDF). Pweforum.org. October 2009. Retrieved 14 February 2016. ^ Mark Juergensmeyer; Wade Clark Roof (18 October 2011). Encyclopedia of Global Religion. SAGE Publications. pp. 1312–. ISBN 978-1-4522-6656-5. ^ Larry Clark; Michael Thurman & David Tyson (March 1996). Glenn E. Curtis, ed. "A Country Study: Turkmenistan". Library of Congress Federal Research Division. Retrieved 25 November 2013. ^ "Asia-Pacific | Turkmen drivers face unusual test". BBC News. 2 August 2004. Retrieved 3 May 2010. ^ a b "Столетие.ru: "Туркменбаши хотел рухнамезировать Православие" / Статьи / Патриархия.ru". Patriarchia.ru. Retrieved 23 February 2012. ^ UNESCO World Heritage Centre (26 January 2009). "Ancient Merv State Historical and Cultural Park". Whc.unesco.org. Retrieved 25 November 2013. ^ UNESCO World Heritage Centre. "Nisa Fortress". Whc.unesco.org. Retrieved 25 November 2013. ^ "Retrieved: 5 April 2013". Internetworldstats.com. Retrieved 25 November 2013. ^ "Turkmenistan adopts 12-year secondary education". Trend. 2 March 2013. ^ "Turkmenistan: golden age". turkmenistan.gov.tm. ^ "Туркменистан: Ниязов решил добить уволенного министра траспорта". Uadaily.net. Retrieved 25 November 2013. ^ "Мы не подведём". Ogoniok.com. Archived from the original on 21 May 2013. Retrieved 25 November 2013. ^ V@DIM. "Могучие крылья страны". Turkmenistan.gov.tm. Retrieved 25 November 2013. ^ "Порт Туркменбаши будет полностью реконструирован". Portnews.ru. Retrieved 25 November 2013. ^ V@DIM (16 May 2012). "Определены приоритетные направления развития транспорта и транзита в регионе". Turkmenistan.gov.tm. Retrieved 25 November 2013. Hopkirk, Peter (1992). The Great Game: The Struggle for Empire in Central Asia. Kodansha International. ISBN 978-1-56836-022-5. Rasizade, Alec (2003). Turkmenbashi and his Turkmenistan. = Contemporary Review (Oxford), October 2003, volume 283, number 1653, pages 197-206. Theroux, Paul (28 May 2007). "The Golden Man: Saparmurat Niyazov's reign of insanity". The New Yorker. "Turkmenistan". The World Factbook. Central Intelligence Agency. "Chronicles of Turkmenistan". Publication of Turkmen Initiative for Human Rights.